Welcome to Up Down Cigar in Chicago! Building on 45 years dedicated to the passion for fine tobacco products, Up Down Cigar's high-end architecture, art and sculpture showcase an extensive selection of rare, premium cigars, pipes, humidors and accessories. This sublime smoker's experience is a must-stop in Chicago for any cigar enthusiast. 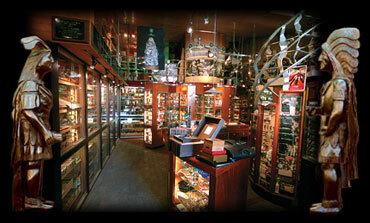 Here you will find the world’s best selection of cigars, pipes, pipe tobaccos and cigar accessories. If you can't find what you are looking for on our webiste, please stop by our store or call us at 1-800-587-3696 and we will be happy to help. Please note we do not accept MasterCard as payment for any Mail/Internet Orders. Up Down Cigar does not sell tobacco products to anyone under the age of 18 (or the minimum age in your local jurisdiction, whichever is higher). We do not sell cigarettes of any kind. Note also that it is unlawful to even attempt to purchase cigars below the minimum age. If you are not of legal age, please do not enter our site. - PRIVACY: First and foremost, Up Down Cigar respects the privacy of its customers. We do not share your address, credit card information or email with anyone else. All customer information is strictly used to process orders and for our promotional correspondence to keep you informed in the most convenient, secure & efficient way possible. If you would like to be removed from any of our mailings, please contact us. - SECURITY: Up Down Cigar protects all information by using a secure server. That means that your credit card number and address are encrypted so that it cannot be read as the information travels via the Internet. We have made it a priority to keep your information and shopping experience a safe one. - SALES TAX: All orders shipped to Illinois addresses will be charged a 9.25% sales tax and 18% tobacco tax. Orders shipped within Cook County will be charged 30 cents per cigar and 60 cents per once of pipe tobacco. Sales tax will not be charged on shipments going outside of Illinois. Please note that any sales tax due in the purchaser’s state is responsible to be paid by the purchaser. - PAYMENTS: We accept Visa, and AMEX. - SHIPPING POLICY: We charge the following rates for all ground packages: · $12.00 - Lower 48 states standard ground shipping · $30.00 - 2nd Day Air, $50.00 Next Day Air to lower 48 All merchandise leaves our facility in perfect condition. Should any item that is received damaged or lost during transit, please call us immediately. The outer packaging must be saved for FedEx verification, otherwise we cannot guarantee that FedEx will reimburse us for the damages. We will reship all items as soon as possible and handle any claim with FedEx for you. - HOW LONG DOES IT TAKE AFTER I ORDER? Orders are processed during our business hours and shipped promptly the next business day unless it is on a Friday, then your order will not ship out until Monday morning. Remember this includes holidays as well. *See the FedEx transit map for approximate package arrival date. - CREDIT CARD POLICIES: We process Visa and AMEX. We utilize AVS (address verification service) on all orders received and verify both the billing address and zip code. If either the address or the zip code do not match, we will attempt to verify the correct address via email and/or phone. If we do not receive a response in a timely fashion, we reserve the right to cancel the order without further notice as a protection for ourselves and credit card holders. - RETURNS/EXCHANGES: Up Down Cigars guarantees your complete satisfaction on every product we sell and want you, the customer, to be happy with your purchase(s). Should you find that something is not to your satisfaction, we ask that you call us and we will make the proper arrangements to remedy the situation. We will gladly refund any merchandise in its original packaging within 14 days of receipt of your order. If you need to return an item, please send INSURED via FedEx, UPS, or parcel post to our shipping address of 1550 N. Wells St., Chicago, IL 60610. Please notify us before returning any items. For damaged merchandise, please retain all packing material and contact us immediately at 800-5UPDOWN (800-587-3696). We will promptly arrange for its replacement. - ONLINE POLICY FOR INDIVIDUALS 21 YEARS OF AGE AND OLDER: This site is not directed to persons less than 21 years of age and no information should be submitted or posted at Up Down Cigars online web site by individuals less than 21 years of age. Sales of tobacco products to individuals under the legal minimum purchase age are illegal. Up Down Cigars makes every attempt to restrict sales of tobacco to individuals of at least 21 years of age. Certain personal information, provided by you, is used to confirm the minimum age requirements. Such information is not retained in our database therefore not compromising privacy.